The madman who calls himself the superintendent of the Los Angeles schools has touched off an absolute firestorm of anger by ordering teachers not to mention Christ during Christmas pageants or other festivities. “The supervisor of music in the city schools rose to her feet and stated that she did not know that such was the position of the managers of the schools; that she had been explaining ‘The Messiah’ to the children, not thinking it possible that there could be any objection to it, and she wished to know what she should do. The Boyle Heights Men’s Meeting issued a resolution, calling the order “unnecessary, uncalled for and therefore a gratuitous insult to the faith of a great majority of the patrons of our schools” and urged the board of education to ensure that such an affront never occurred again. 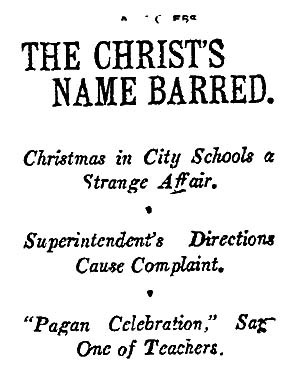 As for what was construed as an order, the educator said: “I did make a request, which from year to year has been made in the city and which, I understand, is made in practically every city of the land that the teachers should, in arranging their exercises remember that the public schools are secular schools and that only those forms of religious reference which give offense to no one have any place in them.” He also cited the California Constitution’s ban on the use of public money for a sectarian or denominational school. The superintendent survived this crisis and lasted three more years at the Los Angeles schools. In 1918, he was inaugurated as head of the Los Angeles State Normal School, the beginnings of what became UCLA. Eventually a campus building was named for him. And when Ernest Carroll Moore died in 1955, he was eulogized by The Times, which once called him “erratic and untruthful” with “long, dull, callous ears,” as a distinguished educator and scholar. This entry was posted in 1907, Black Dahlia, Books and Authors, Education, LAPD, Music, Religion, Streetcars. Bookmark the permalink.